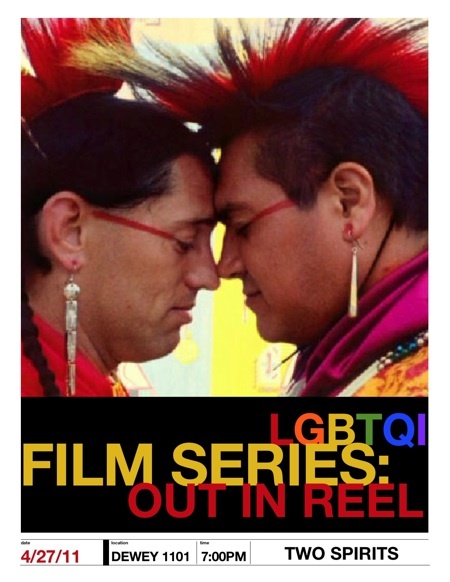 The Susan B. Anthony Institute, the LGBTQ & Allies Special Interest Group at the Warner School, and Film and Media Studies, will screen the powerful documentary Two Spirits tomorrow, 4/27 to conclude our Out in Reel: LGBTQI Awareness Month Film Series. Two Spirits interweaves the tragic story of a mother’s loss of her son with a revealing look at a time when the world wasn’t simply divided into male and female and many Native American cultures held places of honor for people of integrated genders. Please join us at 7:00pm Wednesday in Dewey 1101 for Two Spirits. This free screening includes snacks and is open to the Greater UR Community, so bring your friends! SBAI is proud to be a part of the 2011 LGBTQI Awareness Month initiatives at UR; check back next week for our wrap-up, including a special announcement. This entry was posted in SBAI Events and tagged #filmseries, #LGBTQIawarenessmonth. Bookmark the permalink.